Last edited by gabalgabow on Fri Mar 29, 2019 8:02 pm, edited 1 time in total. TRAUMASPHERE (Fra) Tape out now ! France has had a bunch of great bands and most of them are or have been well known in the underground. And sometimes there are great bands that have been criminally overlooked and that is exactly the case with TRAUMASPHERE. Formed as a duo between Ivan Sikic (vocals, guitars and bass) and Guillaume (drums and keyboards), TRAUMASPHERE has only one independent release, this 4 song (plus an instrumental segment) demo from 2001. And now Visceral Circuitry Records has done a well deserved re-issue on tape format. These guys play an amazingly twisted and evil type of Death Metal in the vein of bands such as COSMIC ATROPHY, ZEALOTRY, TIMEGHOUL and sometimes they even resemble the almighty DEMILICH. Sure enough, there are sloppy bits in the performance, but in my humble opinion it just adds a lot of that organic feel to it. Something that has been lost since the over-produced, perfectly time-aligned, crystalline sounding albums proliferated at the turn of the century, taking away most of the elements that actually made Metal interesting. But fear not. 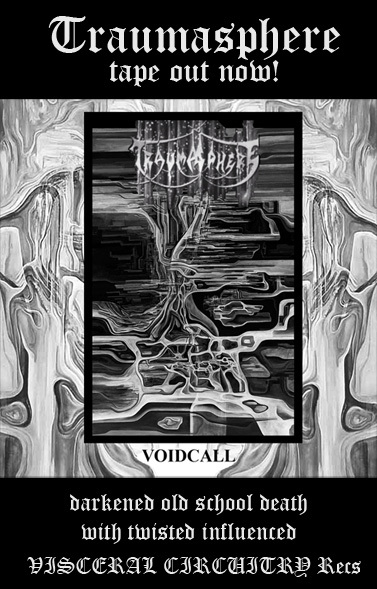 The crushing and dark atmosphere mixed with the horror sci-fi inspired lyrics make "Voidcall" an absolute must if you dig the aforementioned bands. The production is raw, specially the drums, which sound natural and a little muffled. Guitar and bass tones are clear, although the guitars are a little treble side-heavy. But besides that, the mix lets every instrument breathe and everything fits into place. The vocals are deep grunts and some deep clear vocals that add a nice differentiation in the songs. Weird riffs aplenty bond smoothly with a bunch of odd drum patterns. Curiously enough, that doesn't take anything from the songs; they just sound better and way more interesting than just technical wankery. If you have the opportunity to get this demo tape, go ahead and do it. It is worth the money and the time. It is one of the most interesting recordings I've heard lately. Now, this is a posthumous release. The band split up and changed name, not once but twice, with Ivan being the only constant member. In 2005, as ABYSSAL SUFFERING, they released a 3 song demo tape entitled "Soul Pioneer". Then in 2001 there was another 3 song demo tape entitled "Retreat", this time under the UMMON moniker. No more info is available at the moment. So, go get this tape now from the label. Believe me, you won't regret it.